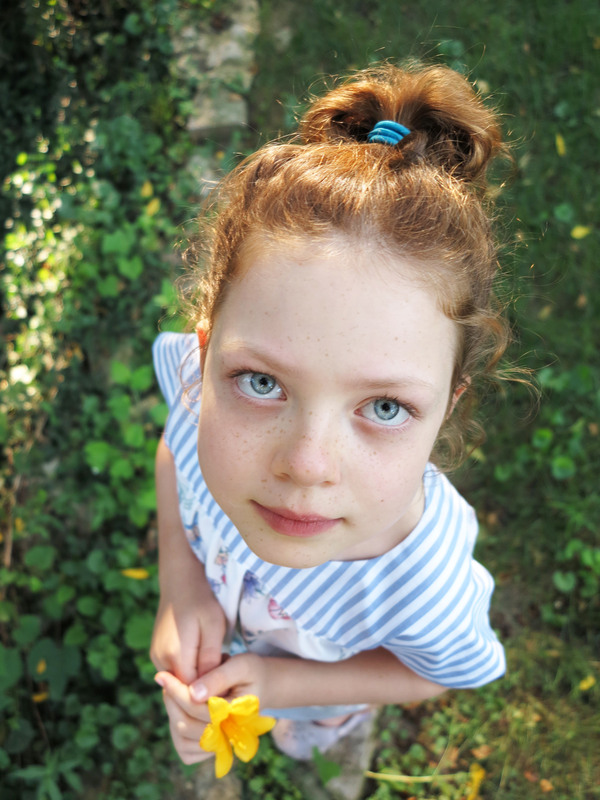 A long time ago, I foolishly used some untreated wool fabric to make a scrappy dress for Miss Seven. Needless to say, the wool in the bodice felted and shrank in the first few washes. I solved the problem by cutting off the bodice and turning the dress into a skirt. That skirt became one of the most worn items in Miss Seven’s wardrobe. I’ve tried to figure out why and I think it comes down to the length (long, but not too long), and the fact that it has these particular pockets. It may also be because the volume of the skirt is not excessive like some gathered skirts can be. It fits the idea of a full skirt, but it is really more A-line in design. 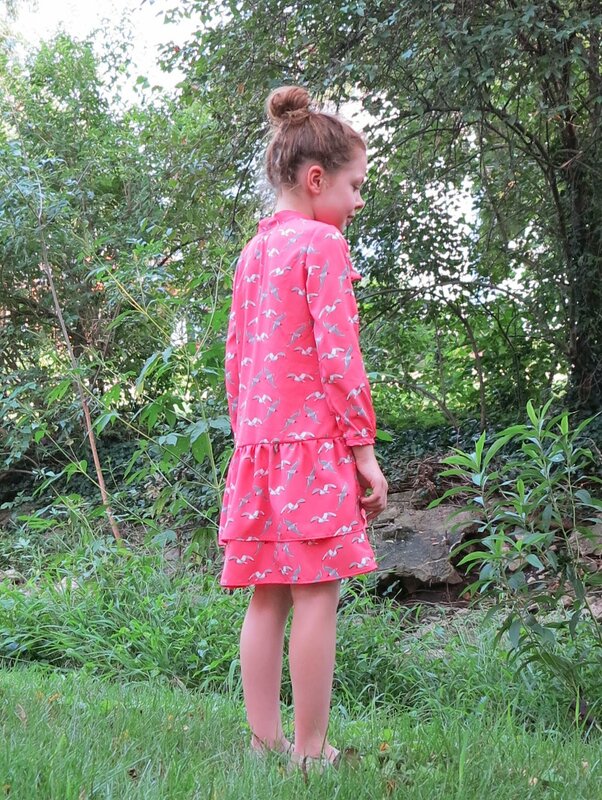 It’s easy enough to turn the Hide and Seek dress into a skirt. I simply cut of the bodice to about an inch above the pockets and drafted a waistband. I kept the front princess seams (for the pockets, obviously), but did away with all the other seams to cut the back of the skirt as one. I retained the subtle A-line shape. 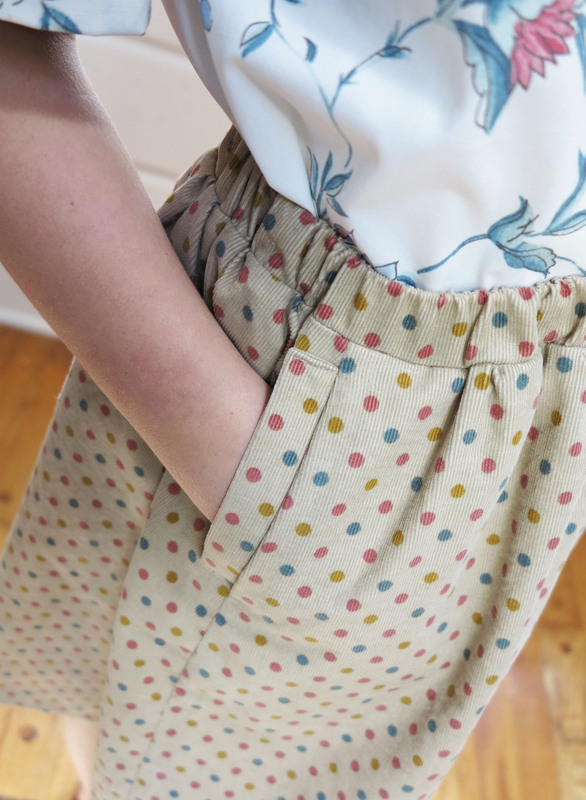 I made this skirt in a lightweight corduroy that will be great for layering over tights in Winter. It also looks great with Miss Seven’s new shirt. I think this little chickadee is developing quite the covetable wardrobe. I’m beginning to get jealous! 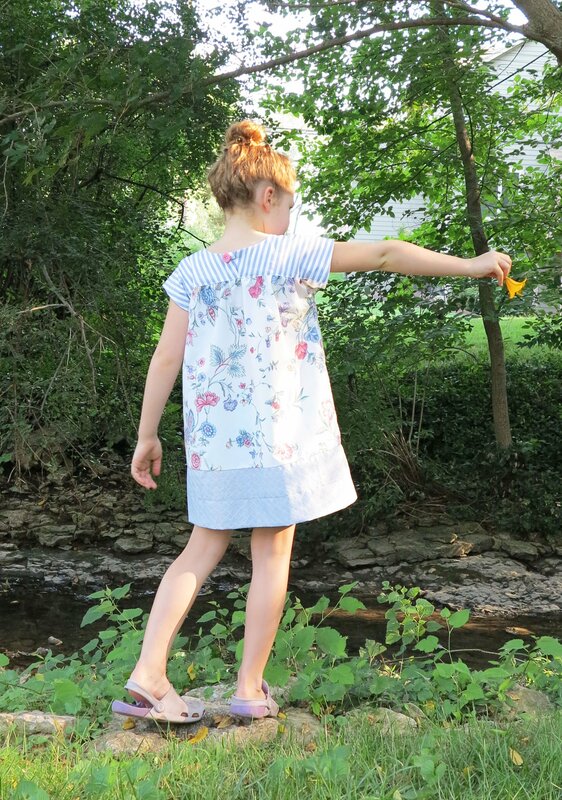 This entry was posted in corduroy, cotton, Oliver + S and tagged corduroy, Oliver + S, skirt on October 18, 2015 by Debbie Iles. 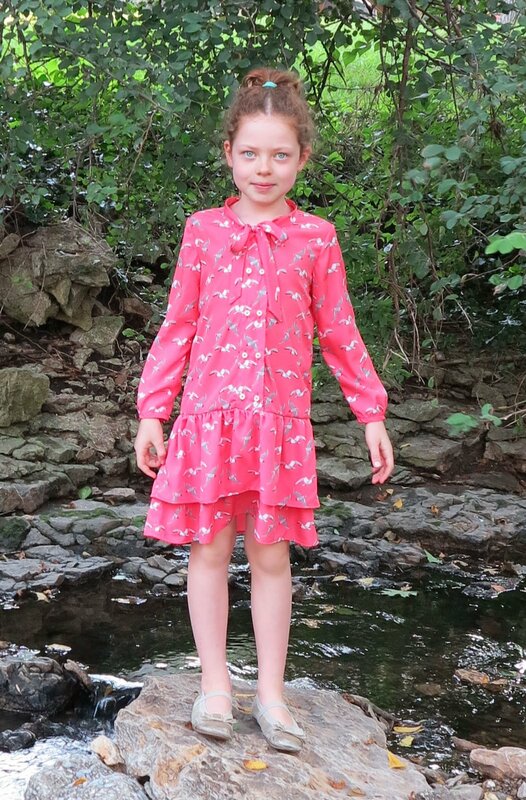 This dress was a last minute back to school wardrobe top up for Miss Seven. 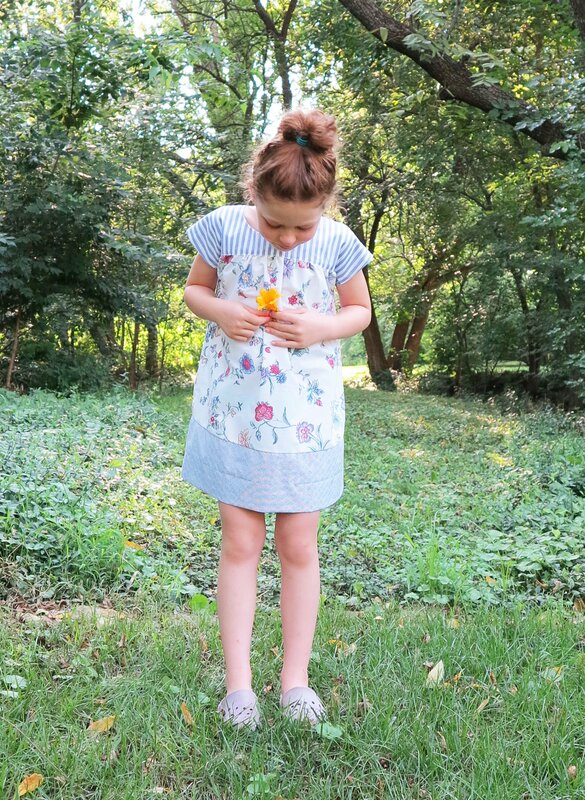 It’s one of her favourite styles of dress during Summer, and the simplicity of the design also makes it a perfect little school frock. It is the third one I’ve made for her. 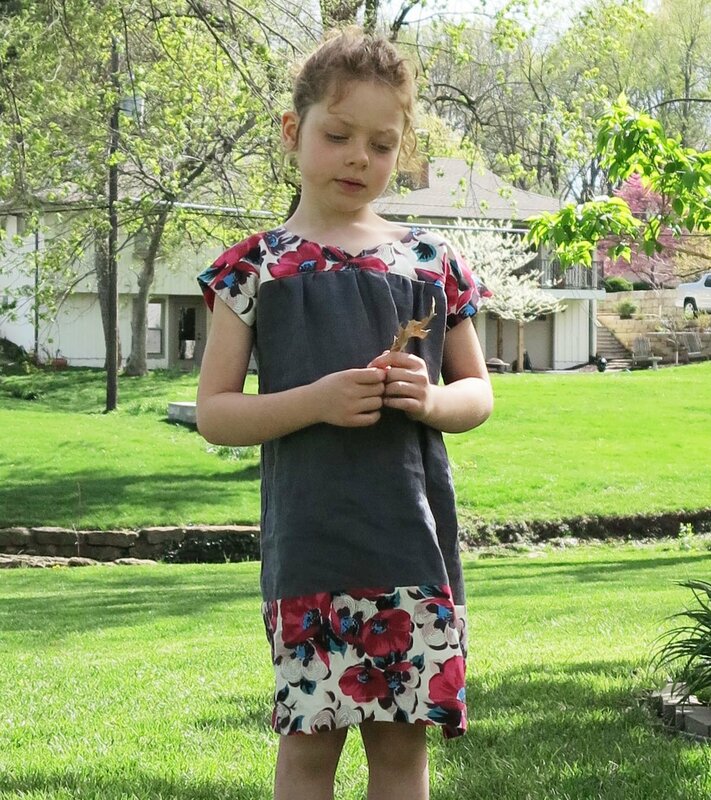 For this version, I made a size 7, but lengthened the dress by omitting the double hem construction. This resulted in a lengthened bottom band which I machine blind hemmed in place. I think I may have forgotten to switch the iron on when I pressed the bottom band! I do that sometimes and wonder why the iron isn’t working. The crease you see is where I’ve blind stitched the hem. I also omitted the front pockets. 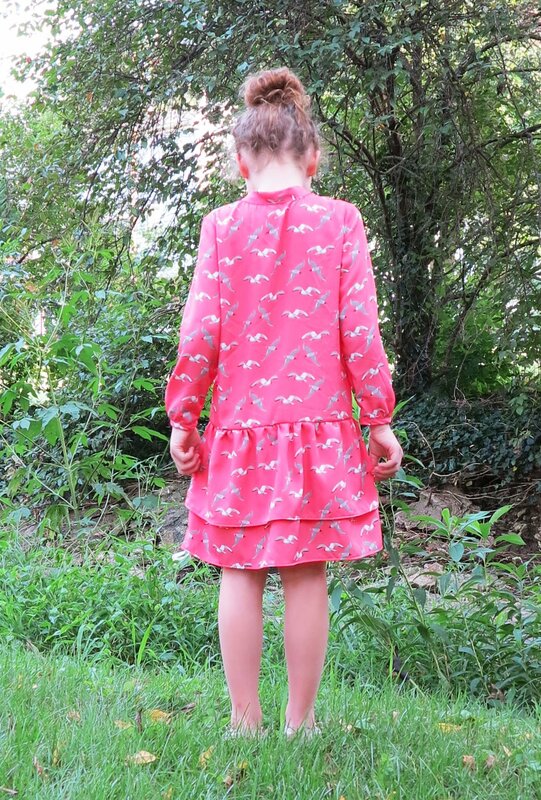 I used beautiful Italian cotton shirting scraps for the top and bottom panels of the dress. 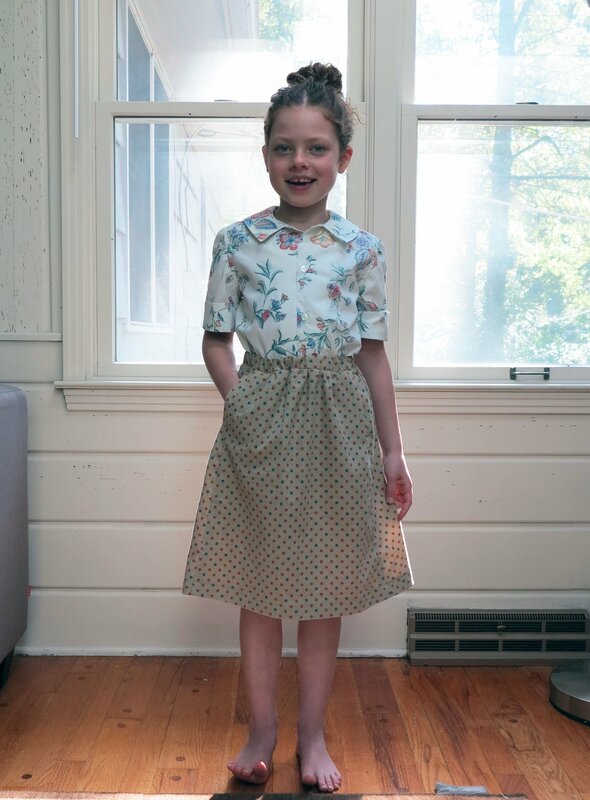 Both fabrics were leftover from sewing her father’s business shirts. The mid section of the dress is from a vintage pillowcase I picked up at an estate sale recently. I love the combination of prints and colours, and I especially love that I was able to use up some very lovely shirting scraps to make it. Now, if only I could get her into a pair of shoes other than those horrid Crocs. 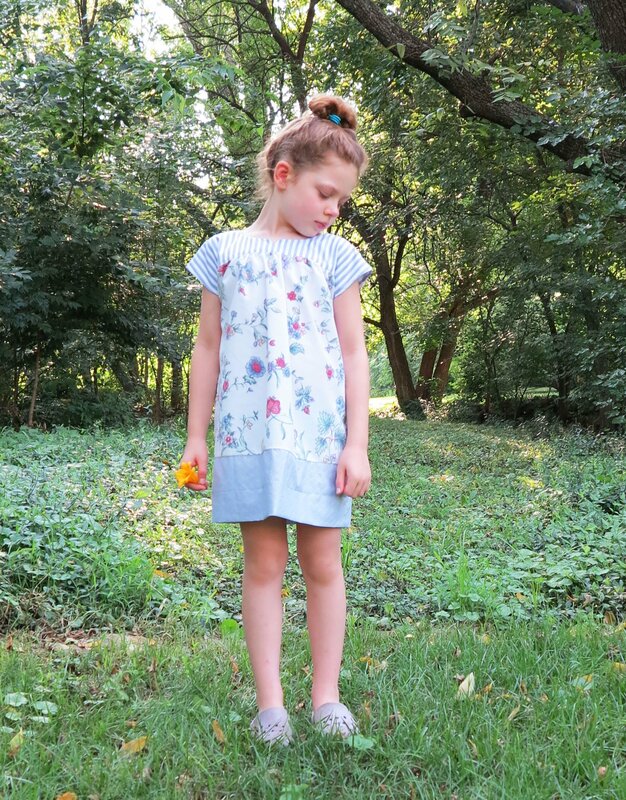 This entry was posted in cotton, dress, Ice cream dress, Oliver + S, shirting, stripes, Tessuti Fabrics and tagged cotton, dress, floral, Ice cream dress, Oliver + S, prints, sheets, shirting, stripes, vintage on August 16, 2015 by Debbie Iles. With the exception of the odd t-shirt, and winter coat, I sew pretty much everything else my daughters wear these days. 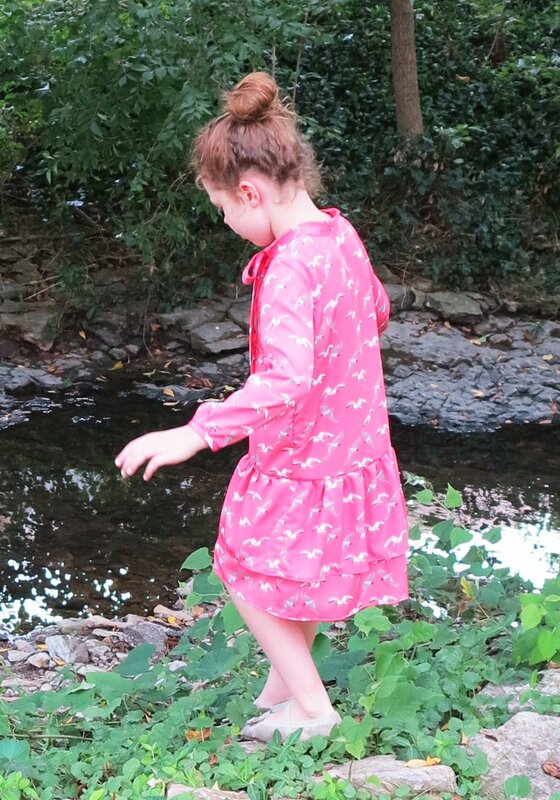 Thankfully, they are all still at the point where they are delighted with anything and everything that Mummy makes, but there are always clear favourites that get worn day after day, literally until they are fraying at the seams. I always find it interesting to see what emerges as the winner, and why. 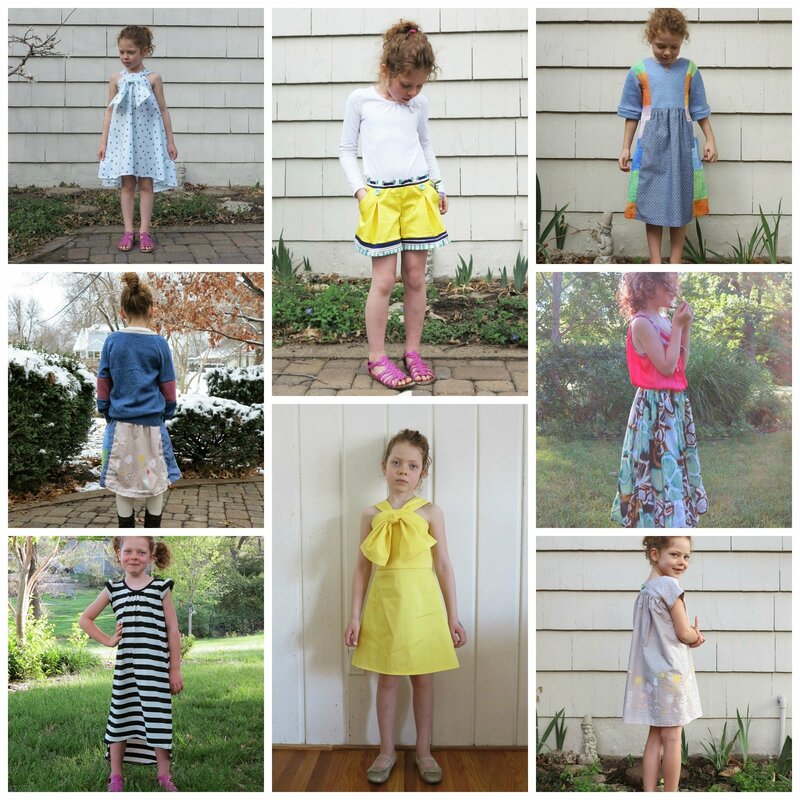 The big winners over the past six months (based on frequency of wear) are (working clockwise from the top left): her Twirl to Me dress (I can’t help but feel a little chuffed with this choice), her recent yellow cartwheel shorts (these surprised me! 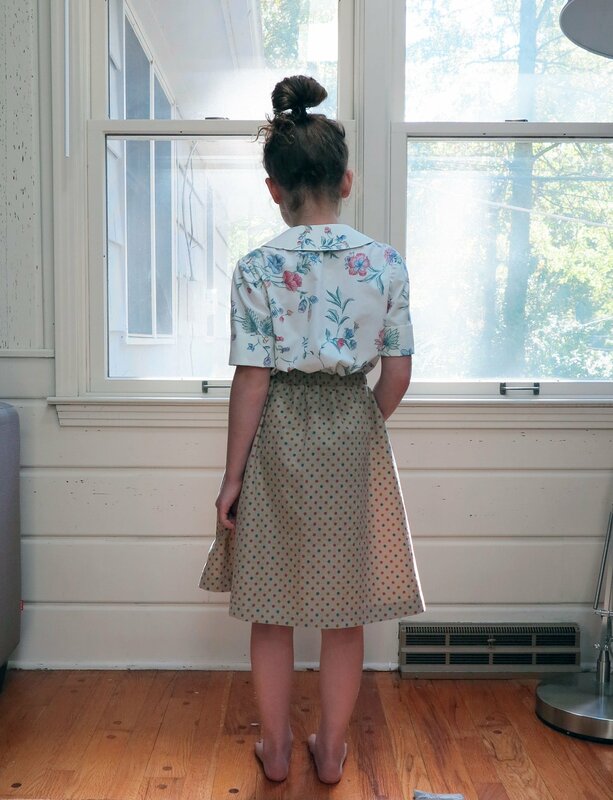 ), the Oliver + S Hide and Seek dress (that retained it’s winning status even when I had to convert it into a skirt), a simple self-drafted cotton maxi skirt, an Oliver + S Ice Cream dress, her Rosie Assoulin knock off, a Go To mini Jaywalker maxi, and finally, that Oliver + S Hide and Seek dress as a skirt and Daddy’s old Ralph Lauren sweater refashioned. My personal favourite is the Rosie Assoulin bow dress. I can’t help but watch her all day when she wears that. So what got me thinking about her favourite makes? 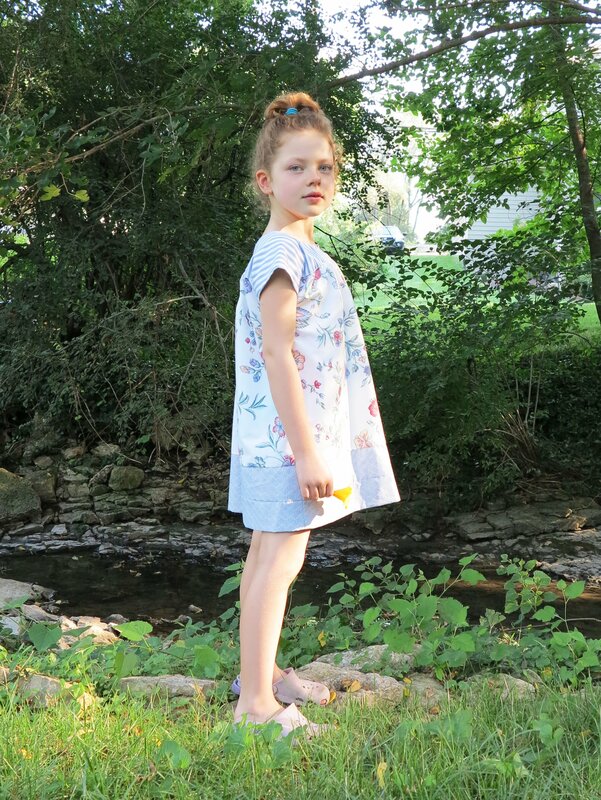 This Ice Cream dress by Oliver + S. I made Miss Seven a new version for her recent birthday. Her earlier version really needs to be retired, and that’s saying something, because quilting cotton is hard-wearing. 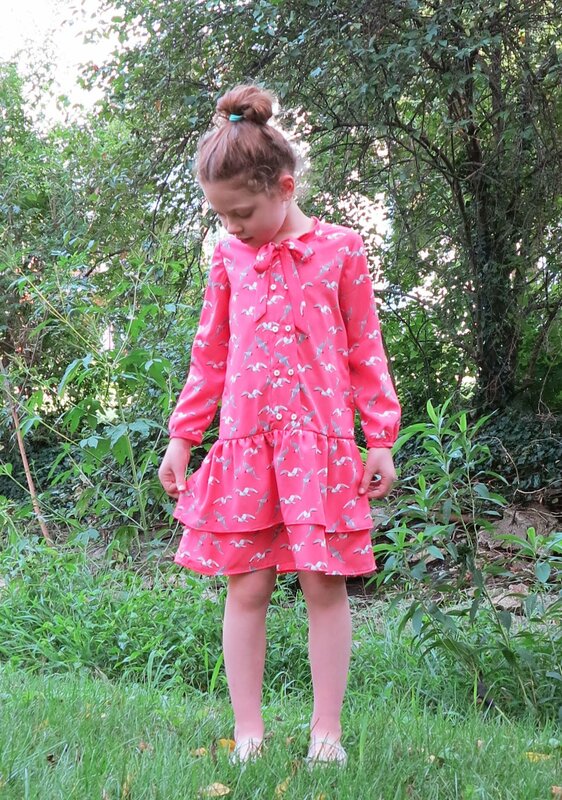 The dress is such a practical and comfortable design for kids. It covers the shoulders and yet doesn’t restrict play. 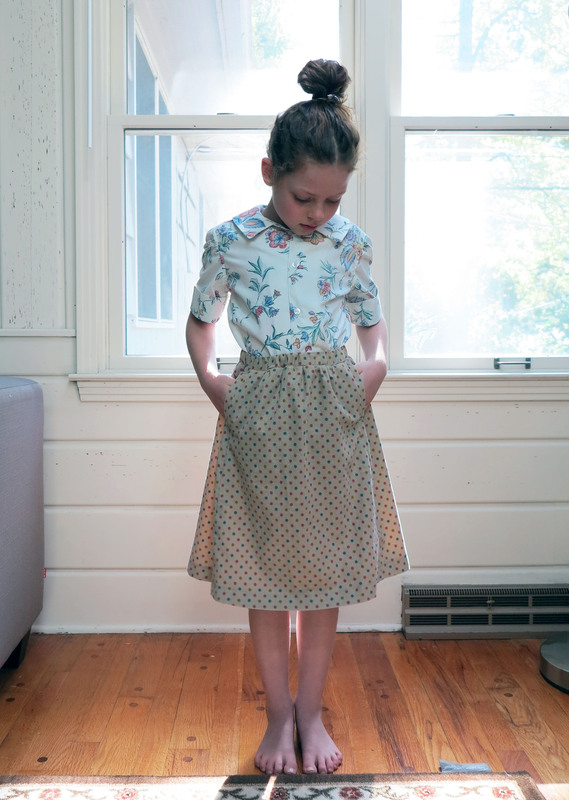 It’s also a super easy sew and has become her go-to school uniform. 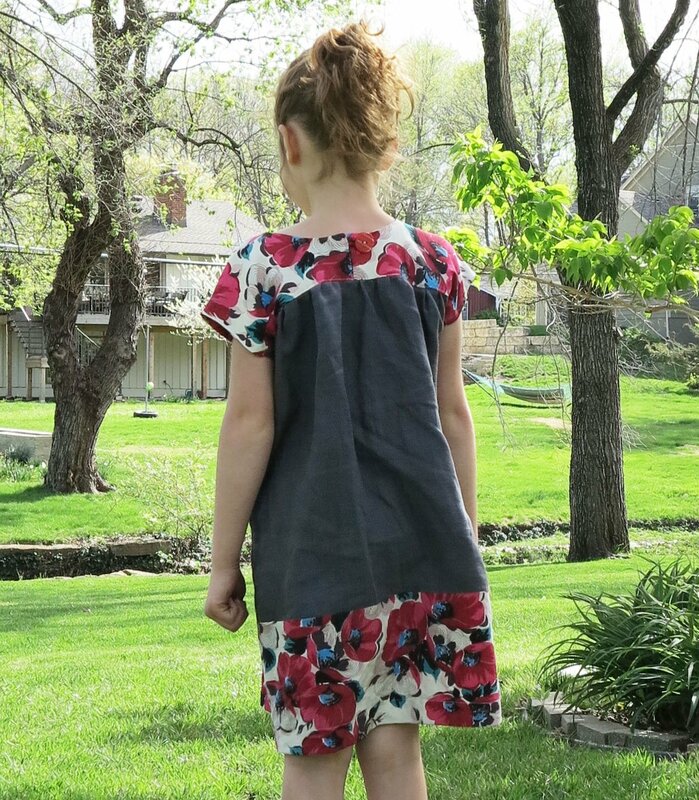 I used some beautiful charcoal linen and a little remnant of a floral linen/silk blend that I was lucky enough to find on the remnant table at Tessuti Fabrics many, many moons ago. I miss my weekly remnant shopping excursions. I had quite the stash of Tessuti remnants when I arrived in Kansas a year ago, but they are starting to dwindle now. 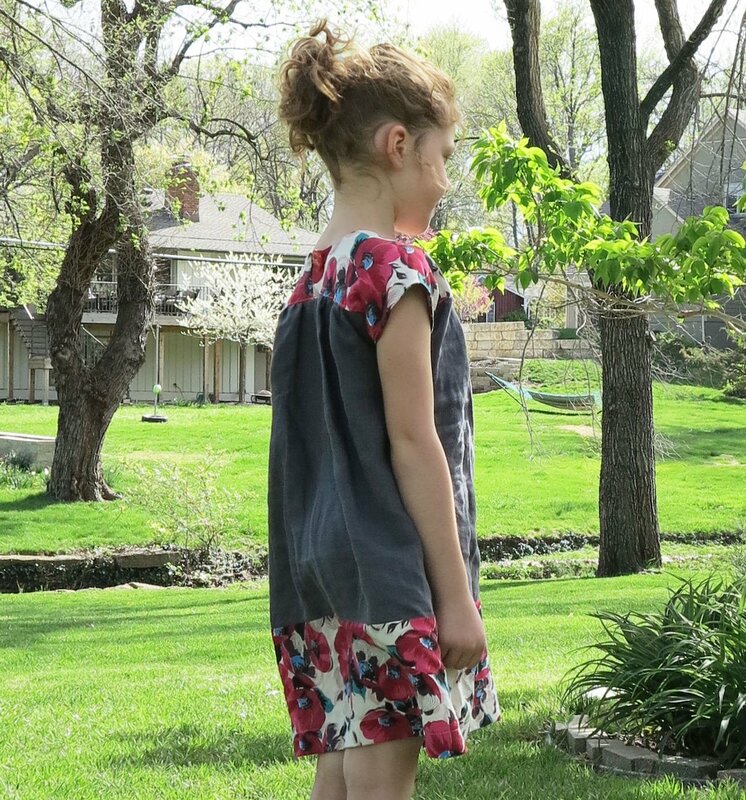 This entry was posted in dress, fabric, floral, Ice cream dress, linen, Oliver + S, red, silk, Tessuti Fabrics and tagged dress, floral, girls, Ice cream dress, linen, Oliver + S, silk, Tessuti Fabrics on April 25, 2015 by Debbie Iles.